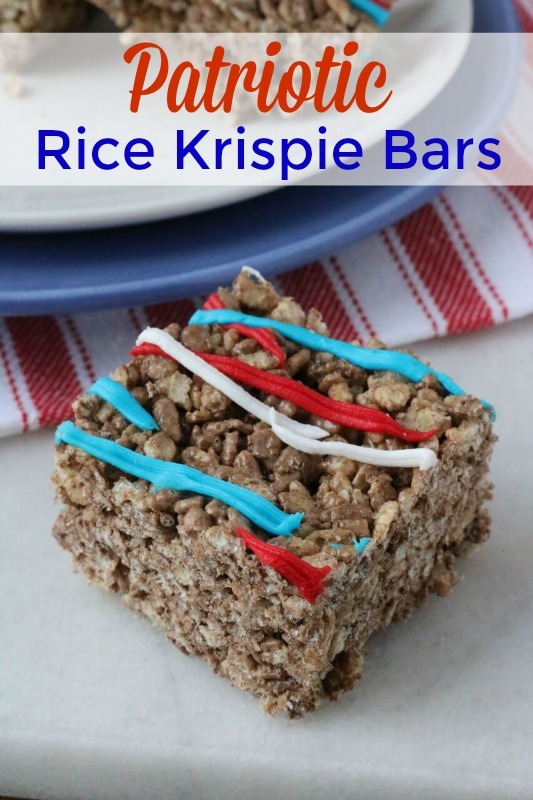 Patriotic Rice Krispie Bars are a quick and easy dessert for your cookouts! The 4th of July is coming up quick and whether you are heading out for a cookout with family and friends, or staying home and having one with your family – you need a dessert. A lot of prep and planning usually goes into the food for the cookout, but sometimes desserts are an after thought (well, at least in my case). If you’re planning a cookout or attending one, these Patriotic Cocoa Krispie Bars are a quick and easy dessert solution. Everyone will love them. Guaranteed. 1. Start by spraying a 9×13 baking pan with non-stick cooking spray. 2. Melt the margarine and chocolate in a large saucepan over low heat. Then add in the marshmallow fluff, cocoa and vanilla. Stir until smooth. 3. Remove from heat and add in the cereal, stirring until the cereal is well coated. 4. Spread mixture in the pan, pressing it down evenly. 5. Let cool for about 20 minutes before you frost them. 6. When you are ready to add the frosting, add a small amount of the vanilla frosting to 3 separate Ziploc bags. 7. Leave one white and add a few drops of blue food coloring to one and red to the other. 8. Snip a little bit off of the bottom corner of all three of the Ziploc bags and apply the frosting how ever you like on top of the bars in the pan. 9. Cut the bars into small squares and serve. Everyone loves Rice Krispie treats, so I’m sure these will be gone in no time! If you are looking for a quick and easy dessert for your 4th of July cookout, these Patriotic Cocoa Krispie Bars are exactly what you’re looking for. Rice Krispie Treats have always been a favorite at my house. I’m happy to see Cocoa Krispie bars and your patriotic spin. They are so cute and I know they will taste as good as they look. Rice Krispies are such a part of our family history. The go-to snack for me as a kid and then our daughter. I love this patriotic version. We have Rice Krispie Treats often here! I’ll have to make this version. I haven’t had cocoa krispies in forever. These rice krispie treats look tasty and perfect for the 4th of July. I need to make some for our party. Rice krispie bars are so easy and fast to make. They are fun to decorate for all occasions and especially the 4th of July. Those look delicious. We love to make rice crispy bars. They are easy to make and they taste delicious. They’re a great treat to bring with you everywhere. Those are very cute. Perfect for al the July 4th festivities, thanks for getting this info out on tie for me to get ready to make these! These look amazing and with or without the patriotic stripes I must try to make them. I will keep these in mind for my kids to enjoy. Oh my these look so good. I love rice crispy, They are good and gluten free! perfect treat for me. I will have to try!! 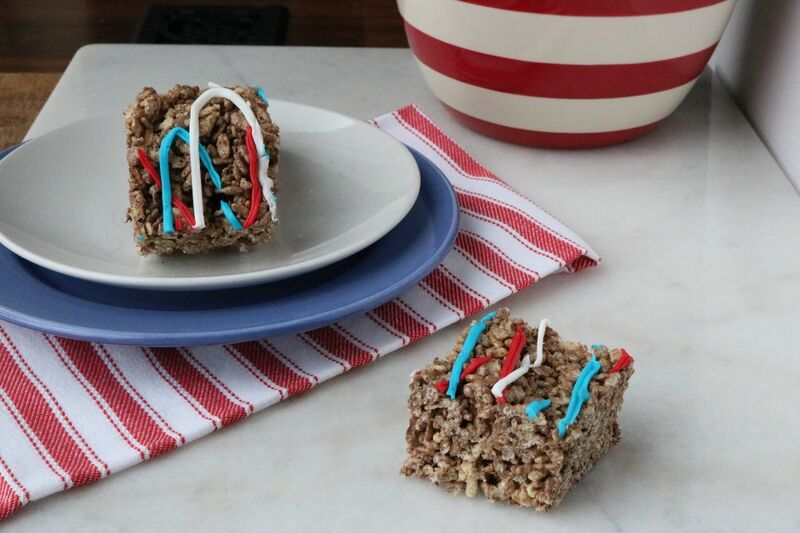 These patriotic Krispies look like so much fun. We love homemade krispies in our home. Rice Krispy treats are always a big hit! I love the red white and blue on top to make them perfect for a 4th party! Those are so cute! I always see them done with the other rice crispies, but cocoa crispies, come on if you are going do it, do it with the cocoa ones! Love it! Very festive way to jazz up rice krispies! These will be perfect for our july 4th barbecue! I have never made coca crispy bars but they look fab and I love the patriotic design on them! Perfect for July! Thaks for the great idea! These look delicious and fun for the 4th of July. I never thought to use fluff instead of marshmallows!!! I haven’t made rice krispie treats in a long time. These look so delicious and they are very easy to make. I think I will make a few for the kids this weekend. This snack is perfect for the big picnics. They fit any summer theme! Now this is a cute, easy recipe I can definitely make! I need to make these ASAP!! So easy and so yummy! These bars are going to be a hit especially since they’re really good too. Love that you added chocolate! 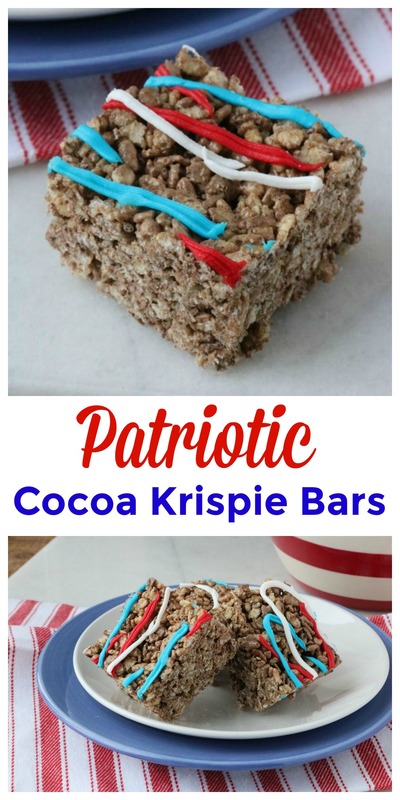 This Patriotic Cocoa Krispie Bars recipe looks so delicious and it so simple to make, I am sure my kids will love it! These rice krispies look so lovely. The coloued ribbons make them all the more alluring and I am sure that they will all be gone in the twinkling of an eye on 4th July. Just in time for the 4th of July! They look simple and patriotic. I like the red, white, and blue drizzle! I love any kind of rice crispy bar! And I especially love them when they’re themed and festive! These look wonderful and yummy! Talk about an easy treat for the 4th of July! Love the fact that it takes minutes to make and you don’t need a bunch of ingredients! It will make the guests really happy too! This is something I can do! I often see complicated ways to make your food fit in for a holiday – Im going to do this with my 4 and 5 yr olds for the 4th of July! Independence day is my favorite day of the year. I am definitely am going to try this one. I know it will put more pounds on me though. Definitely one of the easiest thing to do. Great idea for the July 4th! I love how simple and colourful it is. These are so cute! They look tasty and simple enough for even the kiddos to help make! My kiddos love these types of crispy bars. We will have to make these this year for the 4th. We love rice krispy treats at home. This is a fun way to make it and jazzing it up wi8th red, white, and blue is pretty. OH My GOSH! I can’t believe I never thought about using Cocoa Krispie for treats! This is perfect for our annual July 4th Party! I think this would be a good variation on the traditional rice krispie bar. Have you ever tried the cake batter version? Yummers! My kids favourite cereal is cocoa anything. These would be a sure win in my house that is, if I were to leave any!